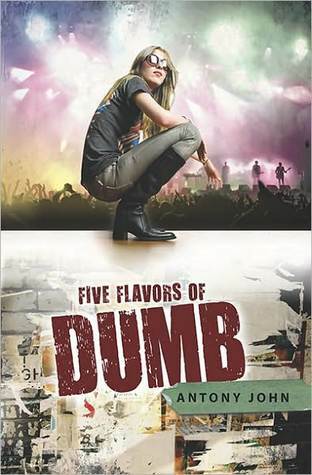 Five Flavors of Dumb is one of the rare YA books that is of literary quality, but is also easy and fun to read. On the surface, the book is about a deaf girl taking a crap band from obscurity to something resembling success. But at its heart, this book is a character story. A tale of self-discovery. Of family. Of friends. And even a little romance. Piper is the undeniable star of the story. She has the typical teenage insecurities, but magnified because her deafness makes her feel like an outsider. Unlike many quiet characters with low self-esteem, Piper is anything but a shriveling wallflower. When she pushes aside the wall she's built up, she is bitingly funny, capable, persuasive, manipulative, bossy - all things that create a fabulous band manager. The author does a fabulous job of creating a flawed character. Piper holds grudges, can be emotional, and jumps to conclusions. These characteristics are shown - not told - throughout the novel. We are quickly introduced to Piper's family: her freshman brother Finn, her baby sister Grace, and her parents. At first, I thought her parents were going to be cardboard villainous adults. Her dad refuses to learn sign language to speak with Piper and her parents raided Piper's college fund to pay for her little sister's cochlear implant. They wanted to "fix" the baby's deafness - further implying that something is "wrong" with Piper. Thankfully, her parents developed into three dimensional characters as the book went on. We saw the strains on their relationship but also the potential for growth as her parents revealed themselves to be people who loved all three of their kids, even if they didn't show it in the best ways. Plus, Piper's relationship with her brother Finn was stellar. They hate each other, compete with each other, support each other, love each other. A realistic sibling relationship if there ever was one. The five members of Dumb were also layered, likeable (with one exception) characters. The most remarkable characters were Kallie and Ed, in that they taught Piper the most. Kallie is more than the tune-deaf, idiot bimbo that Piper always assumed. Ed is a sweet, easy-going love-sick puppy. I adored him immediately and continuously yelled at Piper for being so blind. The plot of the book is shaped around the different events the band participates in, in one way or another. But unlike most books, the plot doesn't define that band's growth. Rather the characters do. Everything that happens to the band, good or bad, is shaped by the character attributes and flaws of each member. The more they tear each other apart, the worse the band gets. The closer they grow together, the better the band gets. I can't recommend Five Flavors of Dumb enough. I don't know if it has or will win any awards, but it deserves to be showered with accolades. I really enjoyed this book, too. Piper's dad seemed awfully one-dimensional at times, but you're right, he definitely grew. I wanted to read it because of the title & cover art, but I'm really excited after reading your review. Oh how cool!! Ha I love the title! I haven't heard of this one before but it does sound refreshing and original I def. want to check it out! I have been meaning to pick up this book for some time. I am so happy to see it impressed, esp. since contemp it isn't usually your genre of choice (or am I wrong about that?). I think your lovely review just convinced me. Great review, Alison! Wow. Her dad refuses to learn sign language even though it would allow him to speak to his own daughter? Nice. Glad to know they move beyond cardboard cutout villains though, and this sounds like such an amazing character-driven story! I think I would really enjoy it, thanks for the beautiful review Alison! Well said! I enjoyed your observations, having read and loved this book. Thanks! This one has been on my wishlist, but I haven't gotten around to picking it up -- now that I've heard you (and your commenters) say how great it is? I'm going to have to push it higher on the list!! I've been wanting to pick this one up for a really time now. I kept reading glowing reviews and then forgot about it. Your awesome review reminded me to seek this one out at the library. I'm glad the parents became three dimensional and that deafness isn't seen as the 'hinderance' of the novel nor a pity party. I think we definitely need to see more of that in YA and books in general. I've had this book on my shelf for a while, but I never got around to reading it. I love the Piper is a flawed character. Those are my favorite kinds of characters. I need them to not be perfect so they will feel more real to me. Like Lisa, I've had this book on my shelf for a while, despite having heard amazing things about it! I love the sound of the family presence in this one. I'll have to make time to read it soon! Nice review! I must get my hands on this book! I REALLLLLLLLLY want to read this! This book sounds really good, I should read it soon. WOW. Legit, as soon as I write this, I'm marking this as To Read on my goodreads page and going to buy it from amazon. Everything about this book sounds fantastic and also sounds refreshingly unique. Thank you so much for the rec and review! Five Flavors of Dumb is now one of my favorite books of all time and I don't slap that label on books lightly. Only four other books have that title and this one right here is number five. I recommend this book to absolutely anyone. As long as you don't hate music (especially rock music), I think you'll enjoy Five Flavors of Dumb.